WHAT IS AIR QUALITY LIKE IN BRISTOL? WHAT IS NATIONAL GOVERNMENT DOING ABOUT AIR QUALITY? WHAT IS BRISTOL CITY COUNCIL DOING ABOUT IT? Air pollution is often invisible, but has serious implications for our health. Evidence shows that spending time in areas with high levels of air pollution can worsen asthma symptoms, damage lung function and harm cardio – vascular health. Air pollution is estimated to cause up to 36,000 premature deaths in the UK every year. 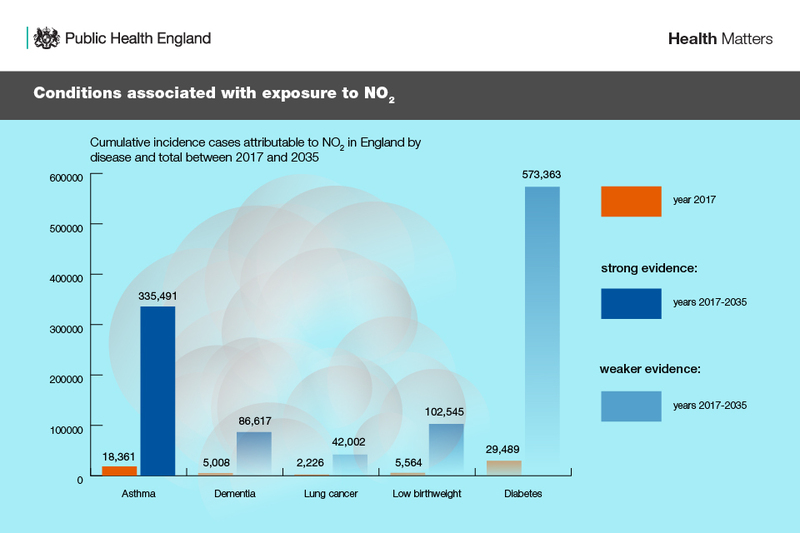 A recent report into the health effects of air pollution in Bristol concluded that around 300 deaths each year in the City of Bristol can be attributed to exposure to nitrogen dioxide and fine particulate matter (PM2.5), with roughly an equal number attributable to both pollutants. 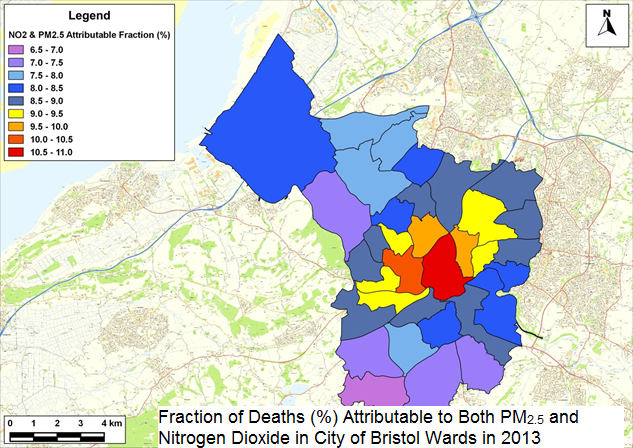 This represents about 8.5% of deaths in the administrative area of Bristol being attributable to air pollution. Although PM2.5 affects health more than NO2, there are still significant health problems associated with NO2 as shown below. Air pollution particularly affects the most vulnerable in society: children and older people, and those with heart and lung conditions. There is also often a strong correlation with deprivation and associated equalities issues, because areas with poor air quality are also often the less affluent areas. The annual health cost to society of the impacts of particulate matter alone in the UK is estimated to be around £16 billion and in Bristol is estimated at £83m. Some shocking facts about health impacts are available from an EU project led by academic and other researchers.